Written originally for a cast of 19 Mountview graduating students, this urgent, contemporary tale exposes the endemic corruption and prejudice at the heart of the Home Office’s immigration strategy, and aims to question all of our attitudes to race, gender and nationality. We’re forced to ask ourselves how we’d feel without the protection of law, society, and all the comforts and rights we take for granted. And we ask questions about identity and ‘home’. And what we’re prepared to sacrifice for freedom. Most of our social and political rights are fragile and, in geological time, recently won. History tells us it needn’t take much for society to regress to brute barbarism. We can’t afford to be smug or relaxed or feel ourselves protected behind the safe and enlightened walls of the European Union. We need to be vigilant and engaged with the life-and-death struggle of the refugee, because one day it might be ours. Karunda shouldn’t necessarily be taken for Uganda, despite the fact that some events in the play have been directly inspired by recent incidents there: the activist David Kato’s murder, the chaotic events at his funeral, and Ugandan MP David Bahati’s attempt at introducing the ‘kill the gays’ legislation. It is estimated (by the UN) that 113 countries are dangerous for LGBTIs. Karunda could be any one of over 70 countries that criminalise gayness. Karunda is less modelled on any of the 7 countries that give the death sentence, but more on any one of the 42 British Commonwealth countries that legislate against gays, especially the handful of African countries where homophobia is currently dramatically on the rise. 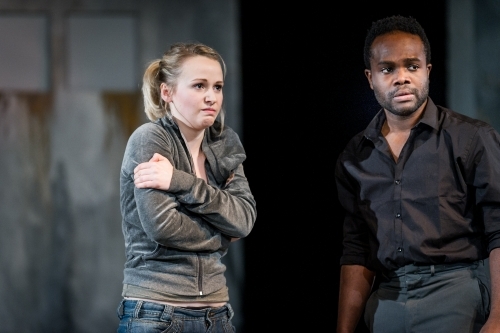 'Kimalia' was written to be performed by a cast of arbitrary gender and race, i.e. the play should be cast colour-, race-, nationality-, gender-, sexuality- and age-blind. For example, a black woman might be played by a white man, or a white man by a Asian woman, etc. PUBLISHER'S NOTE: The play could also be cast traditionally with male and female actors filling the roles that the character’s name would suggest. In this interpretation, the play would project a powerful contemporary critique of the treatment of gays in first world and third world countries.